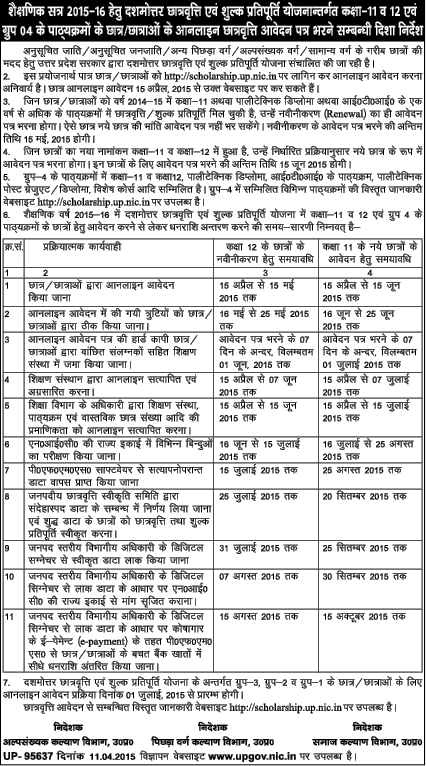 All candidates who filled application form for the scholarship in state of uttar pradesh are informed that post matric scholarship and fee reimbursement will be transfer till the last date which is 15 may 2015 . Scholarship of Chatravriti will be directly transferee in your bank account. Scholarship will be transfer by NEFT / RTGS to eligible beneficiary of the scholarship. Zila pichada varg Kalyan adhikari will send the scholarship via their digital signature through E payment process. So if you are applied for scholarship then don’t wo0rry about this. If your form is accepted an you received confirmation message then you will receive your scholarship till the last date which is 15 may 2015. And we know government invited , online application form for OBC , SC, ST candidates for scholarship d fee reimbursement. Now department published the detailed time table for distribution of scholarship .